Fri., July 20, 2018, 6:08 p.m.
SEATTLE—Bird 7-13 0-0 17, Clark 2-6 0-0 4, Howard 2-9 0-0 4, Loyd 11-15 5-5 31, Stewart 3-11 2-2 10, Canada 1-3 2-2 5, Langhorne 1-3 0-0 2, Mosqueda-Lewis 1-5 0-0 2, Paris 0-2 0-0 0, Russell 0-0 0-0 0, Whitcomb 1-1 0-0 3. Totals 29-68 9-9 78. CONNECTICUT—A.Thomas 1-7 2-2 4, J.Thomas 1-7 1-1 3, Ogwumike 9-14 3-4 21, Stricklen 3-6 0-0 9, Williams 2-6 0-0 4, B.Jones 1-1 0-0 2, Banham 1-5 0-0 2, Clarendon 3-4 0-0 6, J.Jones 2-7 4-4 9, Laney 0-0 0-0 0, Tuck 2-5 0-0 5. Totals 25-62 10-11 65. 3-Point Goals—Seattle 11-25 (Loyd 4-6, Bird 3-4, Stewart 2-4, Whitcomb 1-1, Canada 1-2, Clark 0-2, Howard 0-2, Mosqueda-Lewis 0-4), Connecticut 5-17 (Stricklen 3-5, J.Jones 1-2, Tuck 1-2, Williams 0-1, J.Thomas 0-3, Banham 0-4). Fouled Out—None. Rebounds—Seattle 28 (Howard, Stewart 6), Connecticut 38 (Ogwumike 12). Assists—Seattle 13 (Bird 5), Connecticut 18 (Banham 5). Total Fouls—Seattle 14, Connecticut 16. A—7,908 (9,323). 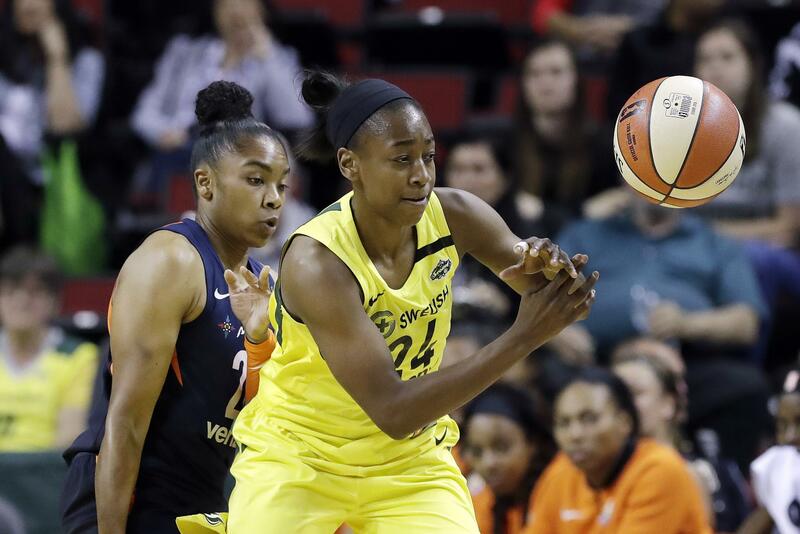 UNCASVILLE, Conn. – Jewell Loyd scored 20 of her season-high 31 points in the second half and the WNBA-leading Seattle Storm beat the Connecticut Sun 78-65 on Friday night. Loyd, who reached 20-plus points for the second straight game, was 11 of 15 from the field – including four of Seattle’s 11 3-pointers. Sue Bird added 17 points and three 3-pointers to help Seattle (18-6) win for the eighth time on the road this season. She moved into third, passing Becky Hammon, in WNBA history with her 830th 3-pointer. Breanna Stewart chipped in with 10 points on 3-of-11 shooting. Seattle won at Connecticut for the first time in five years, taking advantage of the Sun’s 21 turnovers. Chiney Ogwumike had 21 points and 12 rebounds for Connecticut (12-12), which was held to a season-low point total. Published: July 20, 2018, 6:08 p.m.